Soft, creamy, lightfast, and watersoluble, Marabu Art Crayons are wax crayons developed for real mixed media artists. Each highly pigmented color is vivid yet transparent. They blend easily. Use wet or dry on canvas, paper, wood, and more. 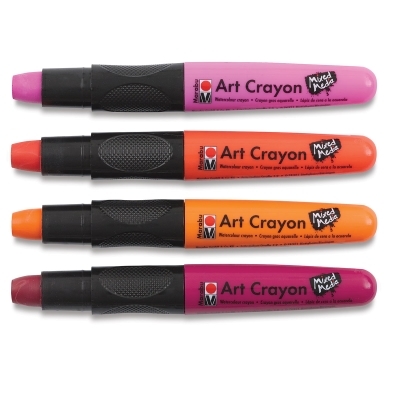 This set contains four crayons, one each of Pomegranate, Orange, Chili, and Rose Pink.